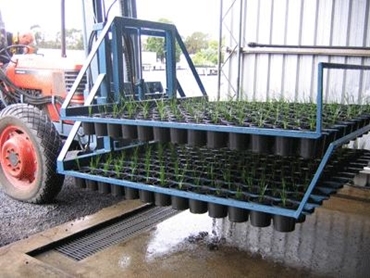 Demtec buffer table systems available from Transplant Systems are innovatively designed to automatically accumulate and group nursery pots into 'pot arrays'. Once the pots are grouped onto the large conveyor, they can be collected by the driver of a tractor or fork truck with a special fork attachment. The driver can control the system from the convenience of his driving position without leaving the vehicle during the loading process. One or two layers of pots can be collected each time. Once loaded, the driver moves to the nursery beds where the pots are set down on the ground neatly in position again. Demtec buffer table systems comprise of accumulating conveyors, positioning system, buffer table, fork arrangements and control system. Automatic watering systems can also be incorporated into the buffer table systems to water the pots prior to setting down if required. Demtec buffer table systems offer user-friendly operation with easy programming using the touch screen control to give different array possibilities. Users can for instance, set a specific program to array pots in a double-spaced configuration on the table prior to lifting. Other pot spacing options are also offered on request to meet individual needs. Demtec buffer table systems offer advantages such as significant saving in production costs from optimised manpower usage. Additionally, workers are relieved of the burden of physically placing stock on the ground. The same forks that are used to place pots on the ground can be used to pick them up for dispatch if required.